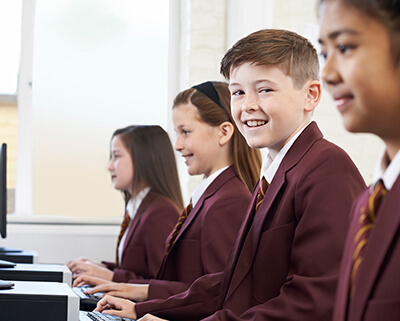 The Danaher Lynch Family Foundation provides support to educational institutions in the greater Philadelphia area with a special focus on the Catholic educational system in Lower Bucks County. It is our hope that we can strengthen their vital role in developing a values based education and academic excellence for the young people in our community. The Pathway Scholarship is a $1000 award offered by DLFF to students entering sixth through eighth grade in participating elementary schools. DLFF encourages students enrolled in values based educational programs to continue on that pathway through eighth grade and beyond. The award selection process is based on completing a DLFF Scholarship application that can be found at participating elementary schools. Each participating elementary school will have a selection committee of their choice to award the DLFF scholarship recipients. DLFF encourages that the selection team look at the whole student and choose recipients that exhibit academic ability, leadership qualities, collaborative and respectful effort in the classroom and financial need. Recipients of the DLFF Pathway Scholarship become part of our unique community of scholars and are given significant consideration for a DLFF CEC High School Scholarship upon application to Conwell-Egan Catholic High School. We believe that Conwell-Egan Catholic (CEC) is a critically important part of the education network in Lower Bucks County. CEC provides an exceptional experience for the whole student through their academic programs, spiritual environment and multiple opportunities for students to become involved in their school community. The Danaher Lynch Family Foundation is pleased to offer DLFF CEC Scholarships for students entering their freshman year at CEC. Applicants may be considered for one of three types of scholarships: The DLFF Community Scholarship, The DLFF Visual Arts Scholarship, or the DLFF Performing Arts Scholarship. DLFF CEC Scholarships are valued at $2,000 per year and are renewable for four years at CEC if the recipient is compliant with the DLFF Scholarship Policy. A DLFF CEC Scholarship is more than a tuition award. Our recipients become DLFF Scholars and members of a vibrant organization committed to unleashing potential through awareness, participation and opportunity. We, at DLFF, strongly believe in selecting students that are committed to demonstrating initiative and playing an active role in their school and community. Through this commitment, students develop lifelong leadership qualities and value the importance of giving back to their community. 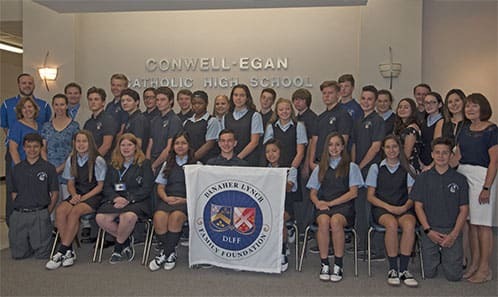 In order to be eligible for a DLFF CEC Scholarship, all applicants must have filed both a CEC application as well as a Facts Grant and Aid application with Conwell-Egan Catholic. Any questions regarding these application systems can be directed to Ms. Kate Rice, CEC Director of Admissions at KRice@conwell-egan.org. The application deadline for the class of 2023 scholarships has passed. Please stay tuned for information about the class of 2024 DLFF CEC scholarships. For more information on our scholarship program, please contact Kathy Shegda, Director of Educational Services at kathy@DLFF.org or Sue DiLisio, Executive Director at sue@DLFF.org.